Looking for a great deal on Brochure Printing? You have found it! A glossy full-color brochure is a sure-fire way to showcase your business, product or service. Brochures can be used to enlarge an image for your business, publicize an event, sell products or for a thousand other purposes. Studies show that people don’t notice that you are a real business until you have some printed material, a 4-color glossy brochure helps distinguish “real” companies from “wannabe’s. Brochures come in many sizes. The Quality of the print should be clear and vivid, and the card stock should be thick. This improves the overall quality and professional look of the final product. We only use photo quality printing to the highest standards, ensuring that your brochure is a professional masterpiece you can be proud of. But don’t let us sway you, take a look for yourself by placing an order or contacting us. Below we have the pricing for the most common ones. 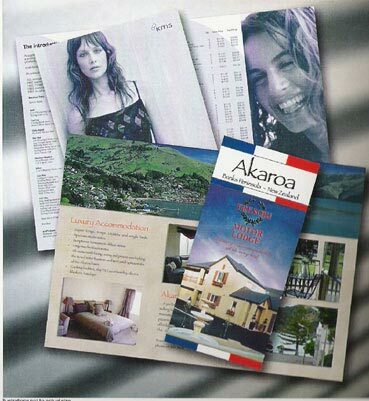 Many companies use a 297mm x 210 mm brochure, folded in three, as an economical presentation of their business. All brochures can have full color printing on the front and back if required. The most common stock we offer is the 150 gsm gloss art which has a nice feel and weight to it. But for larger mail out we can go to 70 – 80 or 90 gsm to keep the cost down . You can do just about everything with a brochure – the only limit is your imagination. Please ENQUIRE about larger runs. For large mail out we can use a lighter stock for greater efficiency. Are you looking for a different size? Click here for Our Rack Card Printing.